“I was beaten up, abused and forced to pick up faeces and excreta despite being hired to do construction work. Modi ji wants to wash the feet of the sanitation workers. Would he ever know what it means to be forced into picking up human faeces?” Asks a teary eyed Kedabai from Madhya Pradesh. Over 50 crore workers in India are employed in the unorganised sector. The National Campaign Committee for Eradication of Bonded Labour (NCCBL), along with district magistrate and local officials, has rescued 125 bonded labourers from four districts. 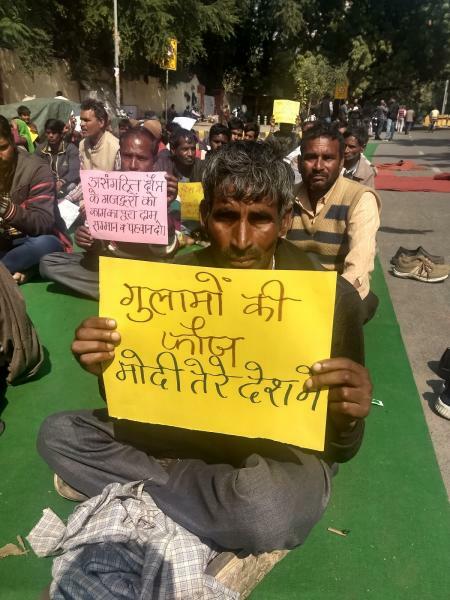 The workers had congregated in New Delhi on the March 1 to give their testimonies, hoping that their voices would reach the Modi government. 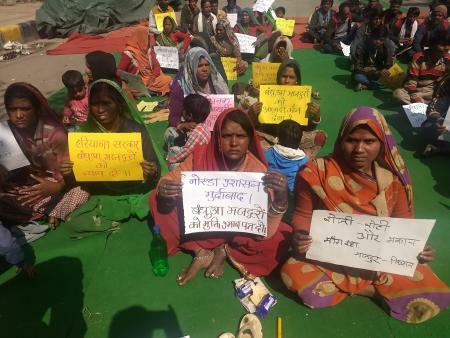 The labourers were rescued from construction sites, by intervening with the local contractors in Ambala, Kangara, Gurgaon, Noida, and multiple districts in Madhya Pradesh and Jharkhand. They are currently awaiting rehabilitation and their release certificates from their respective state administrations. Trapped in the vortex of lack of education and poverty, the only escape available for the labourers was to migrate to other states in search of work. That is where they were lured by contractors who promised fixed pay and decent work. Instead, they were trapped in exploitative conditions, without food and water, living under bridges to sustain themselves, and resorting to begging to survive in the cities. The workers shared heart-wrenching testimonies of being fooled by contractors. 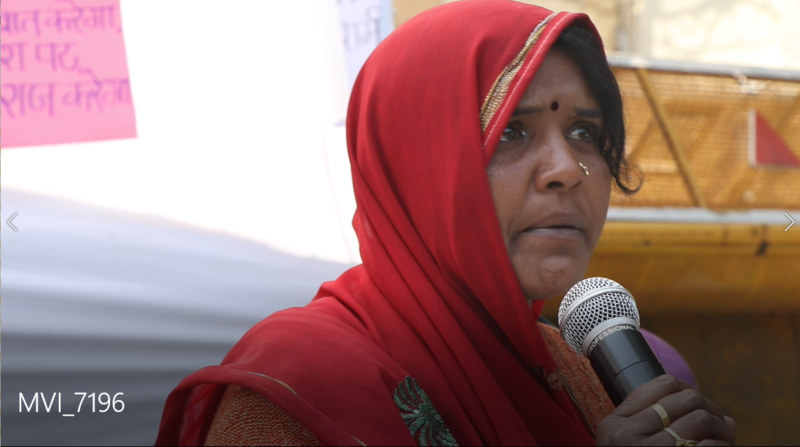 Gita, a woman worker was promised construction work; instead, the contractors forced her to do manual scavenging. “Modi ji, jis janta ne tumhe banaya woh aaj khud gulaam hai. (Modi ji, the people who made you who you are today are slaves themselves today.) Is the life of dignity only something that the rich can afford? Just because I happen to be poor and a woman, do I not deserve the life of dignity?” she questioned. “The contractor made me work from 8 in the morning till 8 in the night, and would beat me up if I tended to my young child’s needs,” she said. He went on to explain that it is the Dalits and the Adivasi communities bearing the brunt of the multiple intersections of systemic oppression placing them in the condition of poverty, regular harassment and the denial of their right to life and dignity. 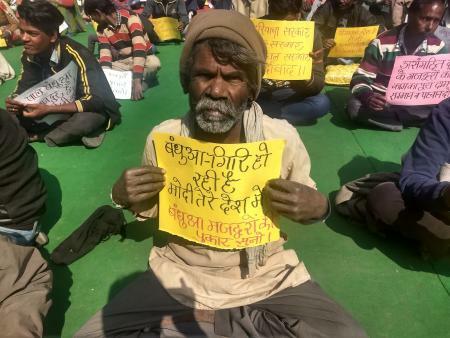 As the 2019 elections approach, the workers have shifted attention to the oldest electoral demands, the basic rights of food, water and housing, which still remain a distant dream for the 50 crore workers even 71 years after the Indian independence.